Winning is about doing something better than your competition. The only problem with that is, oftentimes we have no idea what the competition is doing (differently). And when we know what it is, then the ‘how’ of what they’re doing remains a guarded secret – the genesis of their competitive edge. When it comes to search marketing, SEMrush rewrites this entire concept of competition and competitive advantage. With its complete suite of Search Engine Optimization (SEO) tools, it dissects your competitors’ Google Analytics accounts to give you a behind-the-scenes view of their campaign(s). Imagine what you can do with a full view of and actual data regarding what’s working and what is not working for your top performing competitors. Now stop imagining and embrace the reality – because SEMrush indeed provides you with this crucial information and more. Let’s dive right in to see just how much you can accomplish with the various SEMrush tools. It is difficult to improve when you cannot tell apart the areas you are performing well at from those that could do with some improvement. The SEMrush Site Audit tool helps detect issues related to your site’s content, crawlability, backlinks and code. All you have to do is provide the domain that you want crawled, and within a moment, you get a report detailing the health of your site. With this sort of information, you are able to identify what SEO problems your site may be having, with actionable ideas of how to rectify them and improve your website. Ideally you will want to start by working on fixing errors that you’ll find on the report, then proceed to deal with the warnings and finally notices. You also have the option to enable advanced settings which let you obtain specific pieces of data by having the tool crawl only a specific area of your website such as a subdomain or version like the desktop version. What’s more: once set up, the tool will continuously monitor your site and provide you with real-time report that you can use at any time to run a successful SEO campaign. Google is now more concerned than ever about the quality of content on your site. So, the fact that the Site Audit has more than 60 checks for issues such as duplicate content on your site makes it essential. When you can determine which among your target keywords are bringing you the most traffic, you certainly have a good chance of running a high impact SEO campaign. That is precisely what the Position Tracking tool lets you do. It provides you with a diagrammatic illustration of the history of rises and drops of the keywords you are targeting, so you get to know the exact positions of your keywords in SERPs at different times. Keywords appearing higher on SERPS indicate a successful campaign. Those at lower positions on the other hand indicate that your competitors are outperforming you. From there it is easy to decide which keywords to retain and which ones to change or drop altogether to make your campaign more successful. You’ll love the fact that the tool enables you to track search engine rankings on multiple devices in different locations and levels, down to your city. By comparing your SEO performance with that of your local competitors (which the tool enables you to do), you can know exactly who in your neighborhood is taking away your customers. Position Tracking allows you to monitor up to 20 rivals in a single table. Formerly SEO Ideas, the tool provides you with a complete, structured list of things you could do to increase your rankings for particular pages on your website. The suggestions are based on actual data it accumulates from your top 10 rivals on SERPs for every one of your target keywords. The recommended ideas are therefore the actions you can take to outperform these rivals. The tool further tracks the progress of your work automatically as you go, recording the progress graphically in the Idea Tasks tab. The On Page SEO Checker is designed to help you optimize your site for better search rankings by focusing on individual webpages. You can make the most of it by implementing the suggested ideas. Knowing how other companies in your industry or niche appeal to their audiences can be of great help when coming up with your own social media strategy. That is where SEMrush Social Media Tracker comes in. The tool helps you monitor the social media activity of your competition and shows you exactly where they are outperforming you. This information is crucial in helping you adjust your own strategy accordingly. The tracker can monitor the social media activity plus engagement of up to 20 of your rivals across five different social media channels, including Facebook, Instagram, Twitter, Google+ and YouTube). There is just so much you can do with the knowledge about the best type of content that your competitors share across their social networks. You also get to learn the frequency of posts that work best for each channel. Additionally, you’ll know about any mentions of your business or your rivals on influential social media accounts. This information can be handy when you wish to enter into any mutually beneficial relationships. One of the social media marketing best practices is frequent posting. Creating content and posting it across all your networks is easier said than done, especially when you have profiles and pages on several platforms. Trying to keep up with it may end up diverting much of your attention from focusing on actually running your business. SEMrush Social Media Poster provides an easy way to draft your content and schedule them to post automatically on your Facebook business page, Instagram, LinkedIn and Twitter accounts. The amazing thing is, you can do all these right from your SEMrush dashboard. It’s really easy. You just need to log into the tool and connect it with your social media profiles by tapping the ‘Connect’ button and following the simple steps it will take you through. It is really a big relief to be able to schedule social media posts to go out at the times when the target audience is most engaged. Since the posting is automatic once you have scheduled it, it will never inconvenience you. You can draft your posts and queue them to go out at different times while you go on with the other aspects of your business. We love the fact that we can view the scheduled posts weekly or monthly to stay updated with the social campaign(s). From the same dashboard, you can analyze the statistics that update in real time and see how the campaigns are performing. Like we all already know and as confirmed by Google, a robust backlink portfolio is essential for website rankings. While it’s great to have this knowledge, it’s equally important to know that not all links are equal. Google regards highly only links from high authority sites. More importantly, the search giant will seriously punish any malpractice related to backlinks. This includes having lots of broken links or poor-quality backlinks. Against this backdrop, it is apparent just how crucial it is to have a clean link profile. And you need the Backlinks Audit Tool to conduct a backlink analysis and achieve that desired link profile. The tool does more: it gives you an almost unfair behind-the-scenes view of your competitors’ backlink profiles so you can compare them against your own and silently prepare to beat them hands down. The powerful backlink checker shows you all the domains, IPs and inbound links that are pointing to your website. With just a single click you can compare these with your competitors’ website metrics. The SEMrush Backlink Audit tool is the perfect means to evade Google penalties. It will let you detect any suspicious backlinks pointing to your website, which you can then disavow before Google charges you with black-hat SEO tactics. There are more than 50 different toxic markers that will help you detect such suspicious inbound links. Thanks to this tool, you can completely audit your backlink profile and remain only with high quality backlinks on your website. This is a great way to guarantee greater search rankings and freedom from the risk of Google penalty. You need quality backlinks for your website to get ranked on Google. Quality is key as far as backlinks are concerned, so it will be a big boon to obtain backlinks from relevant sites in your niche. The Link Building Tool is handy in that regard. It collects a list of link building opportunities for your website. It also provides you with a link management interface where you can run an outreach campaign to contact the websites that you have identified for backlinking opportunities. From the interface, you can build your own list of link building targets then run your outreach campaign from the same dash right to the end. The tool further allows you to track your newly acquired backlinks to ensure you do not lose them. You’ll find this tool very important when you are looking for high-quality backlink opportunities within your industry or niche; or when trying to promote a new product or service page on your website by running a new SEO campaign. You’ll want to know how your audiences perceive your brand if you are to launch a successful marketing campaign – the SEMrush Brand Monitoring tool helps with that. It monitors your brand mentions across blogs, news articles and website results. You will be able to launch a high impact campaign when you know exactly where your brand is being mentioned, plus the exact opinions your audiences hold about your brand – all by monitoring their voices from your SEMrush Brand Monitoring interface. You also get to discover the channels that your competitors are using so you can focus on using those same channels to promote your own brand. With the ability to follow your brand’s reputation across the World Wide Web, it is far easier to identify the influencers such a bloggers or websites that you can enter into mutually beneficial relations with. Identifying the negative mentions of your brand by bloggers and reaching out to them to make amends would be a great place to start. Keyword research is crucial to running high impact ads and other marketing campaigns. While Google’s Keyword Planner is great for regular keyword research especially for beginners, it is no match for SEMrush Keyword Research tool if you are looking to get in-depth details and master your keyword research work. This tool takes keyword research to the next level. With this tool you will collect a ton of valuable long tail keywords in a matter of minutes – plus an estimation of their value in both organic and paid search. Additionally, you will get related search phrases that you may need for your campaign, plus detailed reports on terms used by your competitors, and much more. You can even manage to sneak away with some of you rivals’ traffic by importing their Organic and Advertising keywords directly into your own ad groups with this tool. Bravo! You’ll find this tool indispensable when you are working to create your campaign in Google’s AdWords and even when optimizing an existing campaign. This tool syncs your Google Analytics, Search Console and SEMrush data in one powerful dashboard that can show you the “not-provided” keywords which you normally cannot see using your Google Analytics tool. Organic Traffic Insights solves the problem of “not-provided” keywords that usually frustrates SEOs when trying to optimize website for higher rankings on search. With this one powerful tool, you no longer have to shift from platform to platform analyzing multiple data sets to achieve the level of accuracy of data needed to guarantee success. The tool cuts the work for you. Just Sort and Filter your Google Search Console list by keyword metric, impressions, clicks, position or CTR – which is not available in the Google Search Console. Even better, you can send the keywords to the Position Tracking Tool and monitor how your position compares to your rivals for a given keyword. 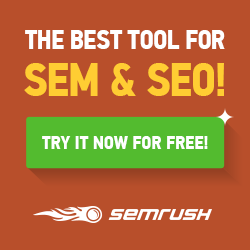 Thanks to these tools and more, SEMrush is a magical solution. Its algorithms are downright great as it always goes a step further in every area that other similar tools also have a foot in. If you wish to create and run profitable campaigns right from start to finish, then SEMrush is for you.